Deputies seize 1.3 million in drugs. 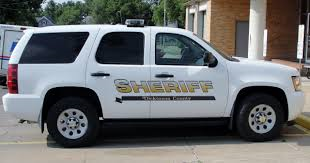 According to Dickinson County Sheriff Garreth Hoffman Deputies with the County Drug Enforcement Unit conducted a traffic stop on January 19th at mile marker 276 one mile east of Abilene on Interstate 70 in Dickinson County. During the traffic stop, Deputies gained consent to search a 2011 Nissan passenger car with Mexico tags. During the search, deputies located a kilogram (2.5 pounds) of pure Fentanyl with an estimated street value of 1.3 million dollars. Taken into custody were 27 year old Victor Hugo Fimbres Pesqueir and 32 year old Diana Aracely Manjarrez Beltran both from Mexico. Both are facing charges of possession of an opiate with the intent to distribute and no drug tax stamp.